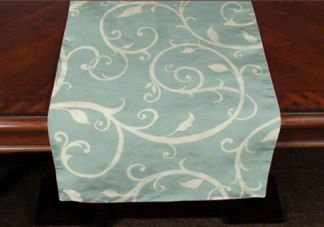 Our Custom Wedding Table Runner is the perfect accent piece to table tops. Because these are custom made, these provide an elegant tablescape for any traditional or contemporary wedding. Choose from an array of indoor and outdoor wedding fabrics to fit a beach wedding or a traditional church wedding. Our table runners are proudly made in the USA. For custom sizes, please contact our customer service department. Recommended overhang for your table runner is approximately 6 to 10 inches beyond each end of your table. Recommended width for your table runner is approximately &frac13; the width of your table.